On a sunny cold Sunday morning in February, FLNPS members Norm Trigoboff, Joe O'Rourke, and I participated in a Keeping Track outing. The group, which is devoted to the tracking of wild animals in our area, was led by Linda Spielman, the coordinator of "Cayuga Keeping Track". We met at the Hammond Hill State Forest parking lot in Dryden. Linda has been regularly monitoring this area for fisher activity. At the very least, we hoped to find some tracks within the mature forest of Hammond Hill. Keeping Track's mission is "to inspire community participation in the long-term stewardship of wildlife habitat . . . [it focuses] on wide ranging mammals [which provide] a vital indicator of the ecological health of the landscape as a whole." They provide educational opportunities to both children and adults "to observe, interpret, record and monitor evidence of wildlife habitat in their communities." 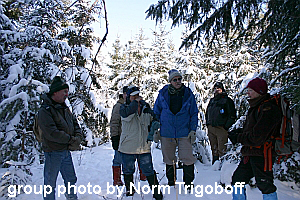 Keeping Track was founded in 1994 by Susan Morse, a "nationally recognized naturalist and habitat specialist with forty years of experience tracking and interpreting wildlife uses of habitat." She operates Keeping Track from its headquarters in Vermont. Linda holds a Ph.D. from Cornell in Plant Pathology and Plant Science. She has studied tracking with Charles Worsham, Sue Morse, Paul Rezendes, and Tom Brown. She has been observing animal tracks and sign at Hammond Hill for more than fifteen years, and she found fisher tracks there for the first time last winter. With the hopes of finding fresh activity, a group of about 9 individuals set out and trudged through 12" snow up long trails that were also being used by cross country skiers that day. Even though the sun was warm, the temperature was around 20 degrees F and everyone was concerned with cold feet. There was about 2 inches of fresh snow fall from the night before which made identifying tracks a challenge. Squirrel tracks easily became confused with rabbit tracks. Turkey tracks blurred into beaver-like tracks. Fresh shrew tracks were identified by measuring their overall width, which is under one inch, hence making them discernable from mouse or vole tracks. 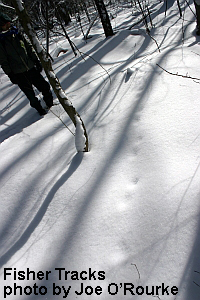 As we trudged along, someone pointed out tracks crossing the ski trail that resembled fox tracks. Due to their alignment, which is specifically off-set and at times in groups of three, Linda was especially interested and had the group fan out long the length of the tracks and follow them as far as possible. Linda pointed out that the tracks went close to older trees and large snags, at which point they seemed to disappear, only to resume again on the other side of the tree. She became excited when, at the base of one of these trees, there was a body print in the snow from where the animal had landed. This meant that the animal had climbed the tree! While foxes do have some ability to climb trees, the size and shape of the body print was not at all fox-like and did match the conformation of a fisher. With this information, Linda made a positive identification that the trail we had stumbled on was that of a fisher! She carefully photographed the site while others in the group followed the trail. 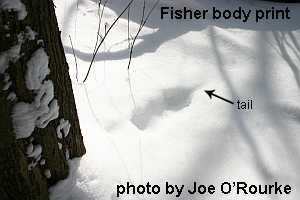 Two other body prints were found where the fisher had climbed and jumped down from an adjacent tree in its search for prey. Fishers are a member of the mustelids or weasel family, which includes martens, river otters, and minks. A carnivore, they are reputed to be capable hunters. They will at times kill more than they can consume, carefully covering the extra with leaf litter, scenting the cache, and returning at a later time to feed. Fishers are found in areas of deep, mature forest. "Despite its name, it does not fish, but it will eat spawned out salmon and trout." (Rezendes, 1999) Fishers are capable climbers, seeking prey in trees and snags and sometimes chasing prey from the ground up into a tree. "The fisher's trail . . . zigzags through the forest [and] will lead you to the oldest trees which are dead or hollow and decaying." (Rezendes, 1999) Here is where prey can be found hiding. The body prints that our group saw were all located near the bases of such trees, demonstrating the animal's proclivity for tree climbing. "Males . . . have a home range of eight to fifteen miles in diameter, females slightly less." (Rezendes, 1999) They are primarily solitary animals. Within their territory, fishers have scent posts, or areas where they urinate and defecate. Rolling in their own body wastes helps them to broadcast their claim. For information about Cayuga Keeping Track and to be notified of scheduled outings, contact Linda Spielman at Lminkspiel@twcny.rr.com or 607-844-8522.